It's usually a good thing to outgrow your childhood interests, especially considering how hard it is to respect an adult who spits on girls, or worse, does magic. Pwning that wisdom to benefit of your walls: Miha Furlan. 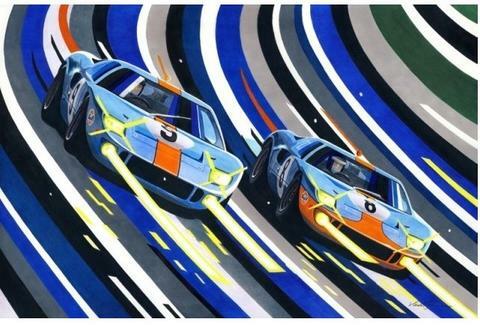 A Slovenian who's been sketching cars since kindergarten, MF celebrates '60-'90s motorsports via hangable art that stylistically ranges from crisp realism to semi-abstraction, and uses everything from colored pencils to markers, but not sniffy markers, because that would be childish. Famous circuits are heavily repped, from a graphite piece inspired by the first lap of a '64 F1 showdown at the Netherlands' Zandvoort course, to a Lancia Delta S4 ripping up a Sanremo rally (this one in crayon! ), to a Porsche 917/ Ferrari 512S drag showdown at the '71 Monza 1000km that has both whips leaving in their wake a bold-lettered "vroom" and speed lines, also the drug of choice at Hendrix Motorsports. He's also got rides at rest, including a graphite depiction of a '70s-era 911 RSR, colorless save for shining yellow headlights; a similarly styled '71 917/20 "Pink Pig"; and an early '60s 250 GTO w/ blank white dots on hood & doors for # placement, though considering they sell for over $15 mil, the dude who has one is clearly #1. If you don't see anything you're keen on, he also accepts commissions, and's "open minded to whatever subject", but don't pick Home Ec, or you'll totally get spit on.